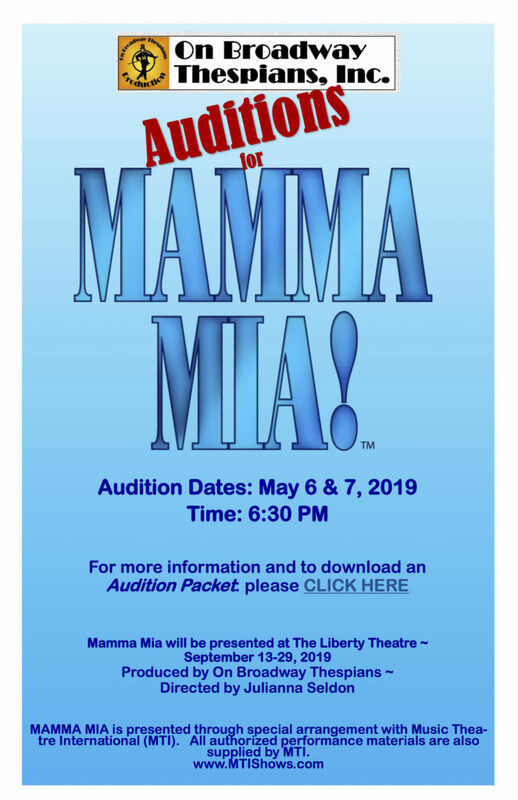 On Broadway Thespians is excited to announce auditions for MAMMA MIA- the Musical! Join us at The Liberty Theater for your chance to be in this amazing show. We are looking for new and seasoned actors to take part in this production. Please click here to download the audition packet to find out more about the show and auditions. Auditions will begin promptly at 6:30 PM Monday, May 6th or Tuesday, May 7th at The Liberty Theatre. Actors are only required to attend one. Those who come to audition should be dressed to move comfortably and be prepared to dance, to sing 16-32 bars (measures) acapella, to present a memorized monologue up to 2 minutes, and to read from various parts in the script. Please bring your completed audition form and conflict calendar, located on the last 2 pages of the audition packet. A callback audition will be on Wednesday, May 8th at 6:30 PM. You must be available for all dress rehearsals and performances to be cast. The show will run September 13th through the 29th, with Friday and Saturday performances at 7:00 PM and Sunday performances at 2:00 PM. If you have further questions, please call or text Julianna Seldon @ (541) 297-7766.